One of the things I’ve been interested in with my Kawasaki Ninja 650 long term bike this year has been its power output. Now I don’t think that it’s particularly bad as standard, and most of the time it’s usually enough to satisfy on the road. However on track it does show its lack of grunt from the 649cc parallel twin engine – something that was particularly evident when I went to Spa-Francorchamps — as the litre bikes were blitzing past me on the long Kemmel Straight. I do understand that I’m not going to make any massive gains with the power without any major engine work. Maybe if someone was intending to take it the the Isle of Man TT Races it may be something to consider perhaps? But not for everyday and occasional track use. 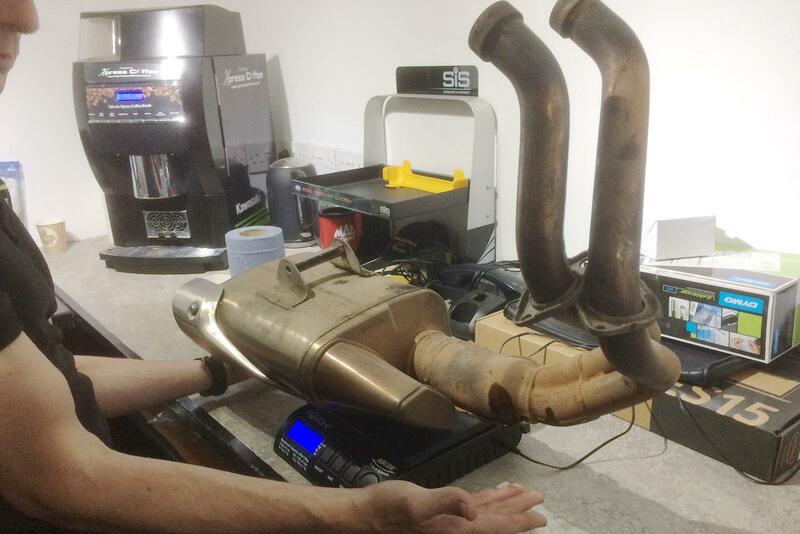 So, I decided to fit a new exhaust system and wanted to take a measure of the gains (if any). While speaking with MCNs Senior Road Tester Adam Child – who’s raced at the TT on the Ninja 650s predecessor, the ER-6 — he recommended an Arrow system. 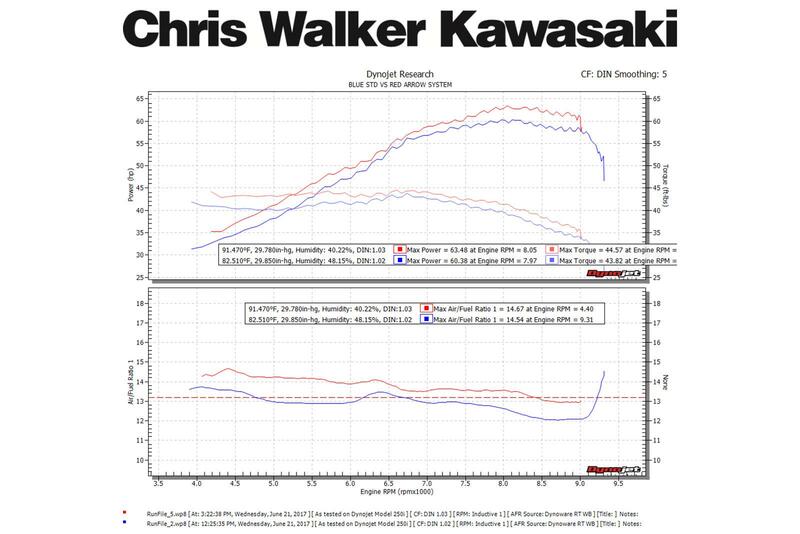 In conjunction with this, I was having the bike serviced at Chris Walker’s Kawasaki Dealership the other week and chose to make use of his dyno. We did a before and after run with the Ninja to accurately judge what happens with and without the Arrow system. 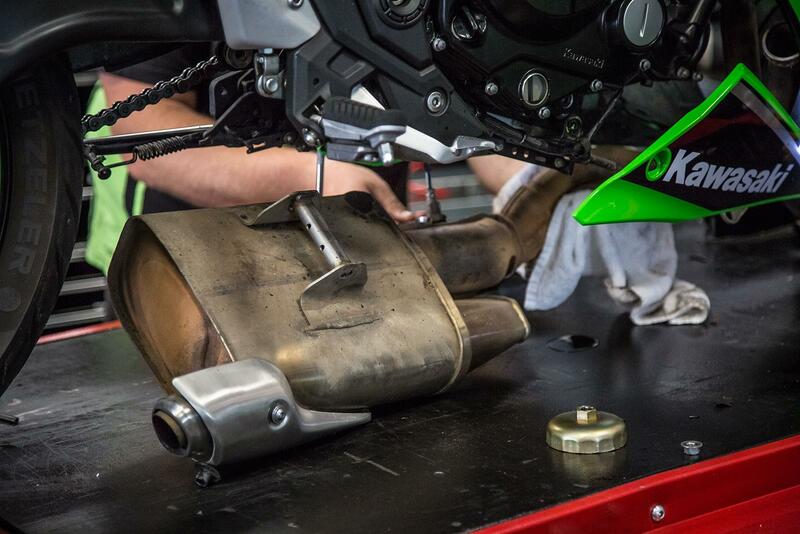 Kawasaki claim 67bhp at the crank for the 650 and when on the dyno, the bike was measured to put out 60.38bhp at the back wheel. With an average loss of about 10% between the crank and rear wheel, it was roughly about what I was expecting to see. The Arrow system measured 63.48bhp at the back wheel, marking an increase of 3.1bhp which wasn’t quite as large as I was hoping for. Interestingly though, there were gains across the whole rev range that averaged between 2-3bhp. Now, it doesn’t seem like a lot but the extra few horses are noticeable and the bike feels that little bit punchier. I never thought I’d be able to feel those kinds of differences, but I was proved wrong. 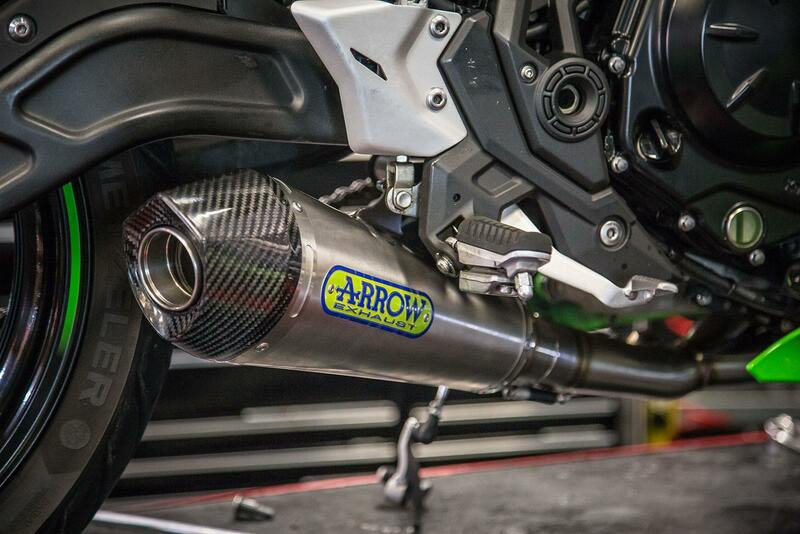 The new Arrow system is lacking a catalytic converter, the manifold pipes are stainless steeland the silencer finished in Carbon and Nicrom (an alloy with stainless steel). What this all means in figures is that the Arrow system is like being on a juicing diet for the Ninja, losing a hefty 4.447kg over the chunky stock system, which tipped the scales at 8.02kg to the Arrow’s paltry 3.573kg. The Euro4 compliant silencer gives the twin a bit of extra bark and makes the engine sound that little bit nicer. The only downside is the baffle isn’t removable. 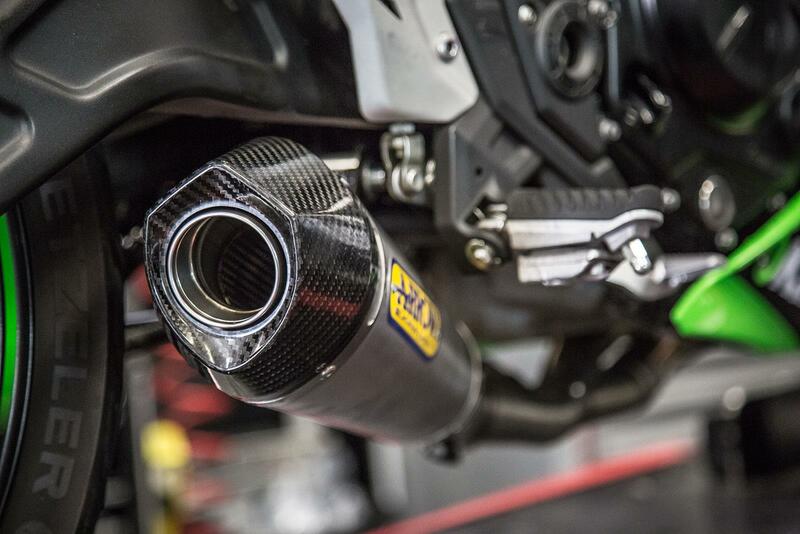 To ensure the can went through Euro4 regulations, Arrow had to make the baffle a permanent fixture, done by means of a small tab welded to the baffle which doesn’t allow the circlip to be removed and thus not allowing the baffle to be freed. There is a way out! With a little bit of carful drift and hammer work, and with the silencer held in a vice, a simple knock to the tab saw it come out pretty easily. The 63.48hp measure was taken without the baffle in and it actually made the bike run a little leaner. I’ll be looking at fitting a fuel module in the future to correct this but at the moment there isn’t one available for the 650. I could get the ECU re-flashed to correct it, but this is not something I would recommend as it would invalidate the warranty should something go wrong with the bike later on. With the baffle removed, the exhaust is LOUD! I’m a bit of a lairy rider, I like to hear the bike making fruity noises, and I'm addicted to the pops and bangs on the overrun. A couple of downsides; Not only does the exhaust (without the baffle) make my whole body reverberate when I'm just standing next to it, it sometimes becomes the centre of attention, and not necessarily in a good way. I’ve actually decided to keep the baffle in, for fear of getting evicted by my landlord for making excessive noise at home (it really is that loud). And I honestly can’t imagine it being able to get through any noise tests on a trackday. The best feature of the new system is the price. 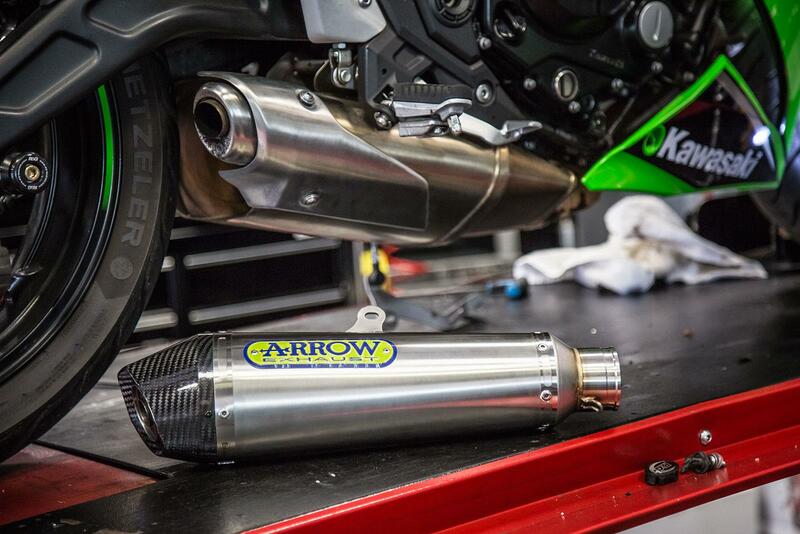 Considering Yoshimura's Stainless Alpha system costs £752 and the Akrapovic system from Kawasaki costs a meaty £1029.95, I was pleasantly surprised to find out the Arrow system is just £655 – clearly a massive saving over the competition. Don't you think? Next, I plan to take the Ninja back on track (haven't decided where yet) and then look at making some alterations to the suspension. Perhaps I'll also replace the brake pads and I'll get a fuel module fitted (if one becomes available). Then put it back on the dyno and measure it all over again.